It’s a funny old world. Ever since the ancient civilisations began painting on cave walls, we have been obsessed with media. Nowadays we log on to the internet or switch on the T.V. to get our fix of daily news, entertainment and information. It could be said that the media now form part of the general texture of experience and in some ways, dominate the way we interact with the rest of civilisation. So, who are the modern-day cavemen? Who are they leaving their wall paintings for and who the hell really cares if Angelina Jolie has a new kid? There are complex relationships between these characteristics and when studying media we must recognise that it plays a huge role in our lives, it mediates our understanding of the world as well as our relationships with others. The texts we study reproduce meanings, information and entertainment and provide us with certain ideological values. We are all invited to take part in the media and it provides a platform for us to share our opinions and thoughts about the world around us. We are given the opportunity to interact with others around the globe that we may never otherwise meet, we are given a voice that we may not otherwise have and we are intrinsically connected to one another through a plethora of mediums. However, we live in a capitalist society, there is money to be made. Therefore a lot of media is bombarded with advertisements, sensationalism, scandal and plain old BS. 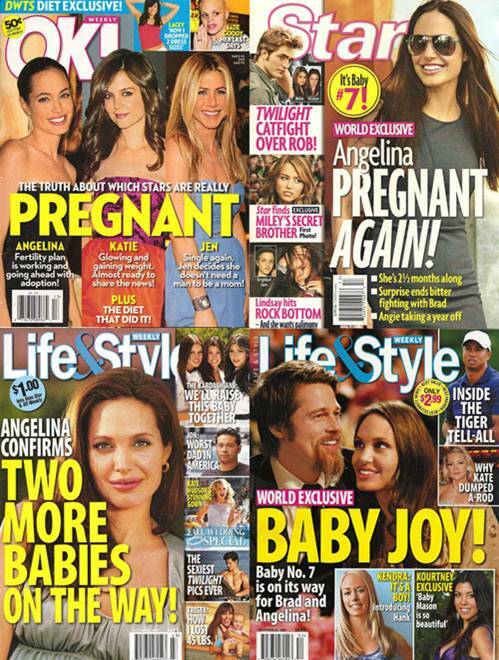 Celebrity lifestyle has become the scourge of the media. Who is to blame? Can we really blame the editors and producers of the world for providing us with that which we crave? True, not all of us enjoy this kind of thing, in fact I imagine that most of my friends could not give a hoot about who is sleeping with who in Hollywood, or which pop star is adopting another baby from a poor African country. However, this stuff sells, by the millions. Someone out there is reading or watching it. When we begin to analyse the texts and breakdown the images, we begin to understand just how involved we are in the world of media. Marketing is a powerful tool. So you may not be interested in Jennifer Aniston’s new dress but you are interested in something, whether it be sport, cooking, skateboarding, computer games, films, origami, wildlife, etc. Sooner or later you have to admit that we’re all part of the machine, for it would not exist if we did not require it. The media can be seen as a reflection of our society and the way in which we live our lives. We may not always like what we see but we’re obsessed with it all the same. I leave you with a quote from the late Professor Roger Silverstone (a Birkenhead lad) from his book ‘Why Study Media?’ which I believe encapsulates our inseparable links with media. I’m off to buy Hello magazine, to get the latest gossip on the lifestyles of the rich and famous. This entry was posted in Media Studies and tagged angelina jolie, audiences, Birkenhead, ceredigion, characteristics, cinema, communication, cymru, economics, fashion, film and media studies, film studies, greg fisher, histories, history, ideology, images, institutions, internet, jennifer aniston, john b. thompson, lampeter, media, media studies, new dress, new media, newspapers, obsession, photographs, photography, professor roger silverstone, sensationalism, society, television, texts, trinity st davids, university of wales, wales, web, why study media?. Bookmark the permalink. 2 Responses to Have you seen Jennifer Aniston’s new dress? Great article. I feel like in the world in which we live today, people need to know how to be media literate. There are so many ways in which information presents itself and not knowing how to decipher their meaning is outright irresponsible. Agreed! Thank you for taking the time to read this and comment. Wishing you a great week ahead!